I am finally catching up with myself after a crazy few weeks so here is another freebie for you to enjoy! It is a sample activity from my popular Language Activity Packs. All the packs contain detailed instructions for you to print and send home for follow through. You will save so much time on homework prep! I just couldn't resist these graphics what I saw them. They are perfect for a summer sporty theme. 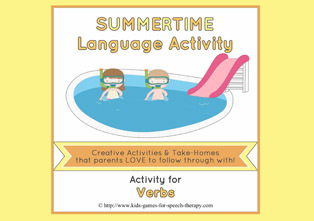 The verbs targeted are kicking, throwing, swimming and climbing. Your Pre - K to 1st grade will love the bright colors as they "play" with the characters. 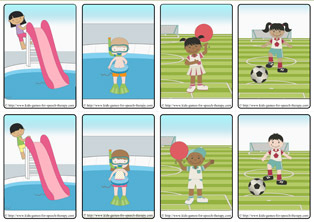 Full color cue cards are included for self-correction and prompting. There is also a written cue option for when you need to save on ink. You will find the freebie for download in my TPT store here. If you download I would love if you would leave feedback for me!